Which way do you slice it? I once asked a project manager how he divided up the work when he started a new project. He responded that you only have two choices: You can slice a cake vertically or horizontally. But no matter which way you prefer to slice it, the problem is that we tend to see only way of doing it – our preferred way, even though there may be other possible solutions, and even if the way we do it today is not the most effective. Let me borrow an example from Eric von Hippel, an MIT professor. Imagine that you have to decorate two rooms, and that you have hired two interior decorators to do the work. How are you going to divide up the work between them? The most natural thing is that they do one room each. Indeed, some will claim it’s the only solution that will work. One may obviously give each of them the responsibility for one-half of each room, but that seems like an inefficient solution. One assumes that both will have to coordinate with each other, if the room is to be decorated in a consistent manner: The solution that the first interior decorator selects for his/her part of the room has to fit with what the other interior decorator selects for the other part. But imagine that both work for a hotel chain that has standardized the way its hotels are built. Then the option of splitting the work up in half-rooms suddenly becomes feasible. The two interior decorators may agree on style and colors on beforehand. Or maybe one can be responsible for floors and walls, and the other one for furniture. The same goes for projects (or indeed, for entire organizations). If you are to design and build two aircrafts, you can divide up the work between two manufacturers by asking one firm to design the engines, and the other firm to design the aircraft bodies. But an alternative is to have one firm do the front half of the aircraft body of each aircraft, and the other firm the back half of each. This way of dividing up the task actually resembles the way Airbus does it, with complete modules manufactured first, which are then attached to each other to form a complete aircraft body. In other words, you can slice it vertically or horizontally. The question is of course how we can know what the most efficient way of organizing things is. 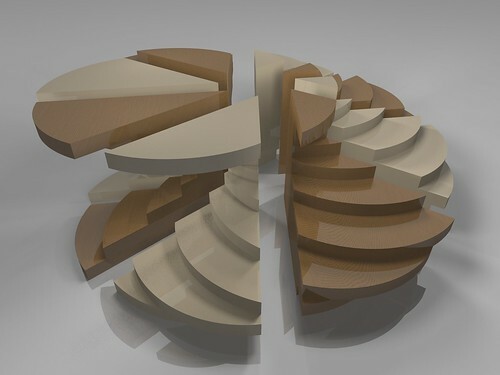 You can see (or guess) the ingredients of a cake – but you can’t tell from looking at people who should work with whom in a project team or unit in the organization. But let’s assume that work is basically about solving problems while exchanging information with other people, in order to coordinate the work in the best possible way. 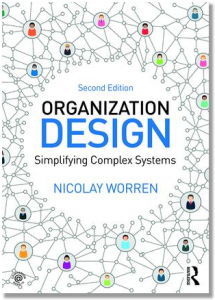 One can then identify how information is transferred (or should be transferred) between people, and adapt the formal organization to the way people actually work. In a small project, this can be done by developing a project plan, identifying how the different activities relate to each other, and spending some time in a workshop discussing the best way to organize the teams. It is by now well documented that by aligning the organization with the work processes (or more specifically, with the information flow and the interdependencies), you can reduce complexity, increase productivity, and increase the ability to adapt to change. You put the people who have the greatest need for coordination in the same unit or team. That way you create more meaningful unit mandates, reduce the number of interfaces, and cut down on the number of meetings needed to coordinate the work. P.S. See chapter 5 of my book for a detailed discussion of this issue.